Beauty , Lifestyle ,food and fashion Blog. You can buy the Book from Amazon - Here . Anupam Dasgupta has done his Bachelors in Engineering from Jadavpur University and MBA from IIM Indore. He has worked more than a decade across roles in Business Development, Consulting, and Strategic Planning. He currently works and lives in Bangalore, India. Anupam Dasgupta writes contemporary fictions largely based on his personal experiences and observations. He firmly believes in the adage " truth is stranger than fiction " and his opinion is the world is full of interesting events and colorful characters. "From Yesterday " is his second novel . His debut novel "Salsa " was in May 2013 and was subsequently republished as "Salsa World is a small place " in February 2014. His interviews and articles related to the book were featured in leading Indian dailies like " The Times of India ", " The Hindu " , The New Indian Express " and " Deccan Chronicle ". Besides his passion for writing, Anupam has an ear for soulful Music and loves Singing. He is also an avid follower of Latin Dance forms and a keen social dancer . 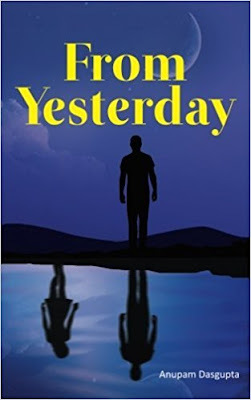 Moving to the book - " From Yesterday " is a story revolving around Adi and Anita . Adi is a management professional from Kolkata who moves to Chennai for work. Anita is a makeup artist blessed with name fame and fortune, yet cursed with lonely and loveless existence. Adi and Anita meet in Chennai and instantly fall for each other. However, Anita's checkered past comes back to haunt her. Many things happen in between. Their lives change and they separate. Adi moves to Chicago for work and happens to meet Christina. Christina gets attracted towards Adi . However, Adi still waiting for Anita .The book is partly written in flashback mode . In between Adi also meets with a Tarot Card reader , Ravena , in a club while dancing . The story is quite interesting . The book compels you to read it further .To know what happens next . Read the book today and discover if Adi And Anita meet again . Is Anita Will come back ? . All these questions will be answered only when you read the book . Though I think that the character of Anita is negative. The best part of the book is the suspense till the end. You can only get to know about it when you read the book till the end. I like the way Anupam Dasgupta wrote this book. The plot is really interesting. Though there are many elements they all connect beautifully at the end . The characters are also drawn well. I liked the characters of Christina and Ravina and also Anita's assistant Hamid. The book in its span of 223 pages did not appear dull at any point. The best part of the book though was its climax,- it was very well written and manages to keep the readers engrossed till the end. Most of the people who relocated to metro cities for a job will relate to this story, the loneliness, the lack of true friends who can be trusted, and doubts and complexes that often destroy relationships. I hence recommended, "From Yesterday " Book to all. I enjoy reading the book. My overall rating for the book is 4.5 / 5 and that says it all. Hello, Fellas !!! I also have a Give away for all book lovers. One of you can win a Paperback Copy of "From Yesterday " Book. Follow my Blog and comment on the blog why you want to win. Tag 2 of your friends , who loves reading and ask them to join giveaway. You can also share at the Instagram post , why you want to win . 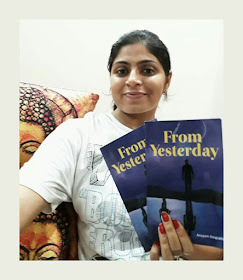 1 winner get 1 Paperpack "From Yesterday" By Anupam Dasgupta Book . The giveaway extent till 13th June . So friends, You have enough time to tag your friends . Do share your feedback in the comment box below. And also share which book you read recently. Really really amazing giveaway and nice review. I love reading books and magazines and newspaper a specially THE TIMES OF INDIA .Sometimes stories on the Internet.and can't live without books . actually i like reading everything. I'm always prefer reading really. I find reading very educating for me...I believe something so magical can happen when I'm read a books . And it's true. so i desperately want to win. MT BIGGEST WISH TO WIN.hope you like my entry. Just finger crossed. Hope I'm win this amazing giveaway. The giveaway was nice . All rules are done ...lots of love. Superb review and i m sure it would help many book lovers. The book sounds good. I should give it a read. This really seems a nice story...it has power to keep up the reeader's curiosity till the end. Would love to win it!! The plot sounds interesting. Love the way you've reviewed the book. Thank you for sharing this amazing review.. I love reading books, and would definitely read this! I love your review. Quite detailed and great giveaway...will definitely give it a go.